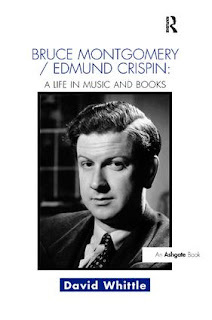 For another project I have been re-reading Edmund Crispin's detective stories and reading a biography of Bruce Montgomery/Edmund Crispin by David Whittle, an enormously charming and talented as well as, in some ways, tragic figure. For those who might not know about him, let me explain that his real name was Bruce Montgomery and he used that to write music, both of the concrt and film variety. Among other scores, he was responsible for the music of the first few Carry On films as well as a couple of Doctor films. As Edmund Crispin he wrote a far too short series of detective novels and short stories about Gervase Fen, Oxford Professor of English Language and Literature. Anyone who reads his novels (and I can thoroughly recommend them for being clever, witty and often laugh-out-loud funny as well as highly literary) must realize that BM/EC was thoroughly conservative in his outlook. As it happens he was also a Conservative in his political support though not always in tune with the party. David Whittle points out that, unlike many of his friends, such as Kingsley Amis, Montgomery/Crispin never went through a left-wing phase. Therefore, readers will not be surprised to hear that he was not particularly enamoured with Edward Heath, the bane of all conservative Conservatives. During the last couple of decades of his life he started a number of projects or, at least thought of them, but did not finish them. It was a very sad tale of decline but has to be off-set by the story of his earlier career, which was effervescently successful. and there is also a savage attack on VAT and on Ted Heath, the Prime Minister for some of the time the book was being written (he is called a 'monomaniac mugwump'). A monomaniac mugwump? Absolutely brilliant. I wonder what in particular the monomania was. Somehow I cannot imagine Montgomery/Crispin to be in favour of Britain's entry into the Common Market.